No, not the TV show … the City. 9. Easiest city to navigate … All the streets run north/south and east/west. Most intersections are “T” grids. Some streets you can literally take from one side of the city and in an hour reach the other side. If you get lost in Chicago then I don’t know what to tell you. May: Italian Beef Festival … Oh mio Dio! August: Festa Italiana on Taylor Street … I’m a be there! 6. Sports … Do I really need to go there?!?!?!?! Yes. Yes I do. Do I need to continue?! Derrick Rose, Jimmy Butler, D-Wade, Thib Thib, Anthony Davis, Jabari Parker, Coach K, Doc Rivers, Chris Chelios, Eddie Olczyk, Shani Davis and last but not least Kirby Puckett. 16. The Boston Marathon & Patriots Day … The Red Sox play early. Everyone calls in sick for work. And everybody’s outdoors enjoying the potentially spring-like weather. It’s one giant party for the entire city. I have fond memories of standing along the route with my best friend from New York, randomly yelling out “Go Paul, Go Adam!” while runners jogged by. I didn’t know any Pauls or Adams’ in the race but I figured one them was bound to named Paul or Adam. 15. The New England Revolution … Yes, I enjoyed the Red Sox, Bruins, Patriots and Celtics. (Especially the 2008 C’s with Garnett, Allen and Pierce … and Doc at the helm… they were unstoppable). But my actual start in the sports TV industry, before the Red Sox, was the Revolution. I was a production assistant and statistician for a number of years, covering every home game (and U.S. games) and loved every minute of it. 14. Walking through the city … Considering it was so small, I walked all over the place: from my apartment in Brighton to Newbury Street, from B.U. to the North End, and from Watertown to Arlington. By the time I left, I might’ve logged more miles than the Israelites’ journey to the Promised Land. I loved walking and Boston was the PERFECT place to amble through. 13. Friendly Toast (at MIT) … My friend and I would wait almost an hour for a table but the New Hampshire Finest — scrambled eggs with goat cheese and asparagus — was everything I ever wanted in life. 12. The close proximity to New Hampshire, Vermont, and Maine … All three states: gorgeous, rustic, picturesque. Great for day trips and mini-vacays. 11. Summer … For one reason and one reason only: ALL THE STUDENTS WENT HOME AND TRAFFIC WAS REDUCED BY A MILLION! T’was a glorious time. I don’t do Super Bowl Parties!!! Ahhhh! I can’t stand them and I’m saying this as a sports-fanatical extrovert! Don’t get me wrong. I enjoy the game, the chicken wings and the commercials. But I’ve been to dozens of parties and I often find myself in a sea of people who don’t know the game of football. So I end up spending most of my time explaining the game, players, teams, and rules to folks who won’t even care on Monday morning and all I wanna do is watch the game. Does anyone feel my pain?! I have a second confession to make though: last year I watched the Super Bowl alone. And I loved it! Yup, the game where Brady and Belichick rallied from 28-3 to win the title game, I watched alone. It was just me, my TV and Chinese food. But I think I found the solution … watch the big game with folks you’ve watched sports with in the past. This Super Sunday I’m going to my friends’ place where I’ve watched plenty of games, including the 2016 World Series and part of last year’s NCAA Tournament. There’ll be a small group of us, some good food and definitely no football tutorials. Yup, that’s my solution from here on out. Tea Recommendation: Ginger spice or peppermint … to quell an upset stomach should the Eagles lose. ESPN’s Linda Cohn put it best: “Women have to fight for credibility.” You have to be better than good in the world of sports. It doesn’t matter that I’ve been a sports fan my entire life (especially of Chicago sports). I’ve been loving the Bears since birth, celebrated every Bulls championship in the ‘90s, cried when the White Sox won it all in ’05 and was even low-key congratulatory when the Cubbies did it last year. And, good luck to them this year. But I know no matter how much I love a sport, played a sport (lacrosse in high school and college) or covered a sport, I’ll never be taken as seriously as a man. I’ve heard some male sports journalists say “Just deal with it.” And for the most part we women do. Most of the time we don’t have a choice. We take the winking and the staring and the laughter. But every now and again you don’t want to “just deal with it.” You want an apology. And as late as Newton’s was, it was appreciated. So, I thank you Cam for the apology. I hope other men will follow your lead. And Jourdan… you did good girl. Thanks for taking one for the team. Tea recommendation: Lady Grey tea … for all Doris Burkeses, Jackie MacMullenes and Claire Smithes grinding it out among the men everyday. Who changes the channel during commercial breaks when you’re watching a game? Who changes the channel when a commercial featuring an all-black cast appears during the NHL All-Star Game? I feel like I did when the White Sox won the World Series back in 2005 or when the Blackhawks beat the Bruins in just 17 seconds in 2013: PURE ELATION! I remember going to my first NHL game in 2008 and my friend and I, who’s Dominican, were counting all the black and brown people we saw at the Garden. I don’t think it was more than five people. But we were thrilled to see other fans who looked like us in the stands. Can you imagine what watching Simmonds win the MVP is doing for a kid on the South Side of Chicago or West Philadelphia or inner-city Boston?! Or, how about simply seeing P.K. Subban and Auston Matthews skate on national TV?! I hope it’s igniting something in them to not only watch hockey but play it. I hope this is a sign of things to come! I’d love to see an NHL full of Black, Puerto Rican, Mexican, Italian, Irish, Syrian, Iraqi, Filipino, Punjabi, and Japanese players. Bleacher Report thinks so too. Just read this gem about by Evan Moore about the black all-stars and the NHL’s future. I know it won’t be easy. Willie O’Ree was spit on and called all sorts of names when he bravely broke the league’s color barrier in 1958. But his efforts weren’t in vain. Tea recommendation: Turmeric tea … to wake you up to something new! It’s National Signing Day, I CAN’T EVEN! In Boston, I used to mentor teens and they always used the phrase “I can’t even.” It was their generation’s “whatever.” I never really knew when to use it until today. It’s National Signing Day and I CAN’T EVEN!!! I tried to avoid it all day. But I simply couldn’t. I got a few updates on my phone this morning. Every other tweet during the day was about who signed where. And the headlines are still flooding my newsfeed at 9 o’clock at night. I’m incredibly happy for the kids but when did this become a thing?! What’s most upsetting is the deification of these kids. Rashan Gray, the nation’s top recruit, decided to go to Michigan. Great! I hope he shines bright like a diamond. I really do. But do we need all the news coverage and interviews and highlights on national TV?! Haven’t we all read the script before? Small-town kid makes it to a big state school and turns into campus hotshot after his highlights lead SportsCenter’s A block for the 15th time in two days. He then becomes No. 1 in the nation and thus untouchable. But then trouble comes. He busts his knee or worse gets busted by the law. The confetti falls. Then everyone starts pointing the finger. Except not at ourselves. We didn’t do anything. We’re bowing down at the next kid. 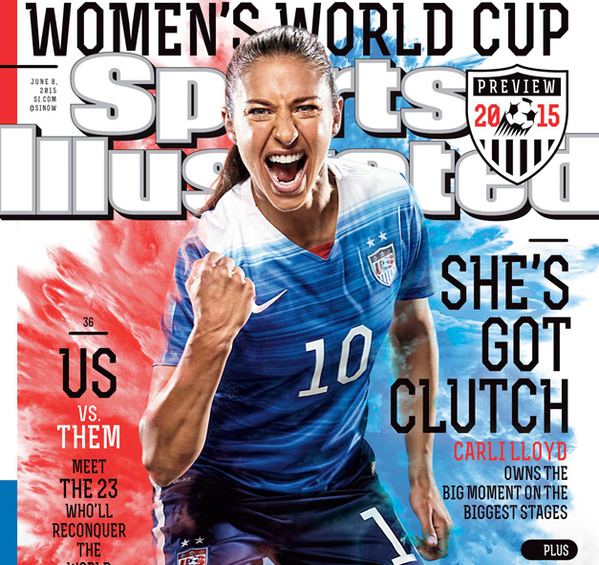 Carli Lloyd is my new Girl Crush! Congrats to the US Women’s National Team on capturing our hearts like Brandi and Mia did years ago!!! And awesome sauce job by the other crushes too: Kelley O’Hara. Hope Solo. Alex Morgan. Abby Wambach. Sydney Leroux. Megan Rapinoe. Amy Rodriguez. Becky Sauerbrunn. Heather O’Reilly. Christen Press. Christie Rampone. Alyssa Naeher. Ali Krieger. Meghan Klingenberg. Julie Johnston. Lauren Holiday. Whitney Engen. Ashlyn Harris. Tobin Heath. Shannon Boxx. Morgan Brian. Lori Chalupny.